EPS Block Molding Machine is integrated with high technology electronic original components having Programmable Logic Controller and convenient to use touch screen displayer. It is designed with self-protection alarms as well as systems to provide the user complete safety while carrying out the production and other processes. This is an easily operated automatic machine available with feeding, pressurizing and other facilities. In addition, it is also designed with temperature controllers to maintain the temperature range. The cooling is managed by high-end pressure sensors. 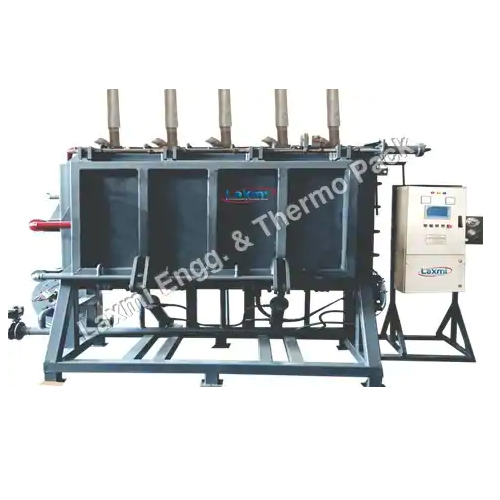 Incorporated in 1987, Laxmi Engineering & Thermo Pack is a well known manufacturer, exporter and supplier of Fully Automatic EPS/Thermocol Cup Machine, EPS/Thermocol Block Mold Machine, Fully Automatic EPS Shape Molding Machine, EPS Shape Molding Machine, EPS/Thermocol Recycling Machine, Pre Expander Machine, EPS Filling Guns, EPS Molds, EPS Thermocol Sheet Cutting Machine, EPS Machinery and EPS Machinery Parts. All our supplied engineering units are superior in quality and best for use in the industrial sections running for heavy product production. Finest employment of the all raw sturdy inputs in these packing solutions and engineering products is in accordance to the global norms and parameters. Safe to heavy products in different production areas all our packs have longer shelf life and optimum working throughout the life. Plot No. 226 & 227, Part-A, M. I. E.